In the State of Texas, it is illegal to operate a motor vehicle in a public place while intoxicated. "Intoxicated" means not having the normal use of your mental or physical faculties due to the introduction of alcohol, illegal drugs, prescription drugs, or any other substance into the body OR having a blood alcohol concentration of 0.08 or higher. "Driving" under Texas laws means operating a motor vehicle. This means that a police officer can arrest and charge you with DWI even if the car is not moving. Texas has very serious consequences for driving while intoxicated (DWI) charges, even if it's your first offense. You face an automatic driver's license suspension 40 days after your arrest if you fail to request an administrative license revocation (ALR) hearing within 15 days of the arrest. As an experienced Austin, Texas DWI lawyer, Betty is dedicated to making certain that each and every person who's charged with a DWI knows exactly what types of consequences they face, and she will defend their rights before a jury if need be. As of September 1st, 2005, Texas DWI laws became even more severe. 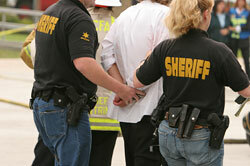 To see how this may affect you and your DWI/DUI charges, contact the Law Office of Betty Blackwell today. Don't be left to defend yourself against your serious DWI charge alone or with a defense lawyer who doesn't know Texas DWI law. Don't jeopardize your driver's license by waiting too long to request a hearing. Betty Blackwell is an experienced trial lawyer with over 30 years defending people charged with crimes. She is Board Certified in Criminal Law by the Texas Board of Legal Specialization. Betty can help you! Read our important information about consequences of DWI, and about the civil charges which could result in having your license revoked.